In his first solo exhibition at Galerie Alexander Levy, Milan-based visual artist Luca Pozzi experiments with the communicative qualities of movement and explores the mysterious place that is formed between two entities held apart in space and time. Curated by Carson Chan, ‘Discovery & Premonitions’ validates the intangible space between the observed and the imagined, with particular attention paid to the movement that occurs during the transition between these two states. Luca Pozzi – Discovery & Premonitions | Jun 25 – Jul 30, 2016 | alexander levy, Berlin from Alexander Levy on Vimeo. 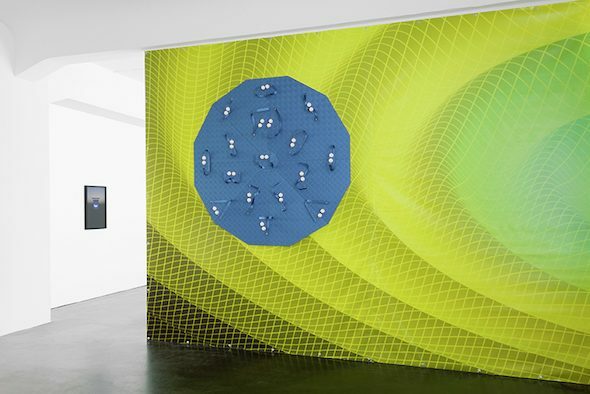 In a poignant demonstration of the creative potential of this space, the ‘Wilson Tour Loading’ installation features a series of photographs that capture the moment a tennis ball passed in front of an installation of paintings by Italian painter, sculptor and theorist Lucio Fontana. 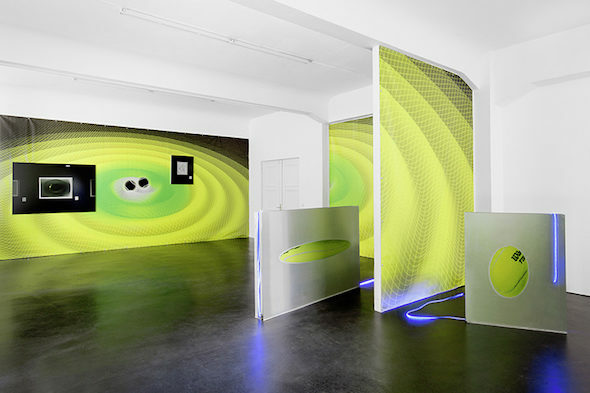 The manipulated photographs give the appearance of a wormhole or whirlpool surrounding the tennis balls and are intended to capture two moments: the observed moment the ball passed in front of the paintings and the imagined twenty-two years that remain until the copyright surrounding Fontana’s works expires. The written works of famed theoretical physicist and cosmologist Stephen Hawking have played a key role in Pozzi’s artistic practice in recent years, particularly in regards to the artist’s interest in theories concerning black holes. 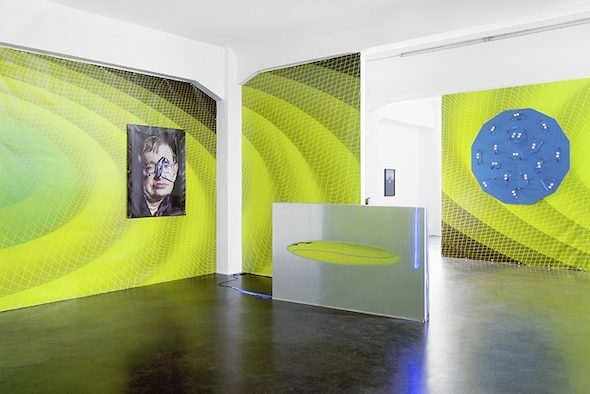 In the ‘Hawking Radiation’ series, Pozzi has reproduced a portrait of Hawking and affixed it to the wall with a magnetised ping-pong apparatus. Virtually motionless and wheelchair-bound due to motor-neurone disease, Hawking’s unbridled imagination has theorised some of the universe’s most complex and energetic phenomenons. With his eyes seemingly fixed on the space between the balls, Hawking’s portrait illustrates the disparity between the scientist’s physical immobility and the energetic activity of his intellect. 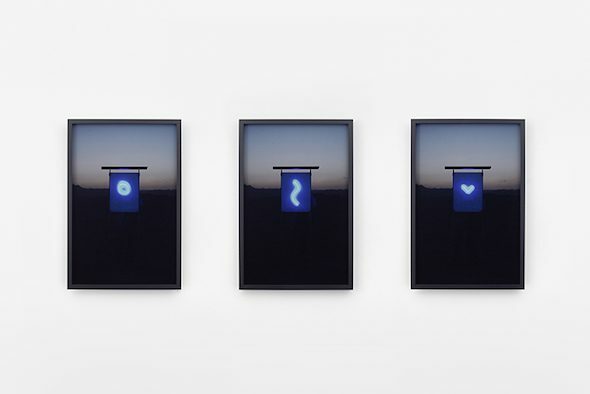 ‘Oracle Blue Windows’ documents an experimental performance where Pozzi ‘painted’ nine different symbols in light using a UV laser projected onto a photo-sensitive screen in a barren middle eastern landscape. Created in collaboration with the Eternal Internet Brotherhood during Pozzi’s travels in Palestine, Israel and Jordan, the work explores the collision of space and time, with the ephemeral performance of the laser experiment now transformed into photographically fixed images preserved for all time. Perhaps the most intriguing aspect of the exhibition is ‘Super Layer’, a seemingly simple installation of aluminium slabs that are actually components of the Large Hadron Collider at CERN, one of the world’s largest and most respected centres for scientific research. The slabs were intended to record the collision of two particles accelerating towards one another in the collider. Rarely permitted to leave CERN’s premises in Geneva, Switzerland, the slabs were given to Pozzi as part of the cross-disciplinary relationship that the artist has formed with the scientific institution. ‘Discovery & Premonitions’ is accompanied by an immersive soundtrack of gibbons cheeps and chirps, reminiscent of the simulated sound of gravitational waves passing through earth based detectors. According to Thai folklore, gibbons are believed to be reincarnations of disillusioned lovers and their calls thought to be cries of longing to each other from the mystical recesses of the ethereal world. Originally intended to represent the gravitational waves created by objects as they move through the universe, this alternative reading of the soundtrack allows the viewer to experience the highly conceptual and scientific concepts of the exhibition in a more emotionally relatable way. Caitlin Eyre is an Australian freelance writer living and working in Berlin.